Back to your original question. I would adopt a "wait and see" posture. The first iteration of any brand new design is bound to have a few glitches. I'd wait until the new cameras have been out for almost a year and the manufacturers have had time to tweek the design to eliminate most of the glitches. It has been said that a smart man learns from his mistakes, but a wise man learns from the mistakes of others. Let the early adaptors learn from their mistakes. Let the manufacturers have time to correct their mistakes. You can be the wise one who learns from their mistakes if you just give them time to make the mistakes. If memory serves me Canon did so ( https://en.wikipedia.org/wiki/Canon_EOS ) and Nikon fanboys excoriated them to this day for that brilliant move seeing as 95% of today's digital camera users have no clue what an FD lens is let alone ever used one. Because of that brilliant visionary move going digital/electronic they were able to make lenses then that are 100% compatible with the latest cameras today with no loss of features. All EOS cameras too, not just a select few are compatible across the entire range of lenses. Yes the M requires an adapter to mount but no loss of function and so it will be with the Canon FF mirrorless camera if an adapter is needed. All your EF lenses will work just fine with AF and aperture and focus as they do now. Exactly my point. At the time, I was using Nikon F3s and a Canon A1. Did it bother me that Canon switched mounts? Hell, no! After reading all the reviews and talking to folks who bought into the new system, I understood why Canon made the leap of faith. It took them to #1. Canon was very smart when they developed the EOS system and EF mount. Most of their EF lenses work with adapters, not just on their M series, but also on Sony mirrorless and Micro 4/3 cameras! Nikon's lenses are mostly manual when adapted to other brands (Oh, I think there's finally one adapter for Nikon to Micro 4/3 that retains most automatic functions, but it didn't perform well in the CameraStore.tv review I saw). Once Canon and Nikon put out a pro level mirrorless, the old mirror and prism will begin to die a fairly rapid death - just like film cameras.did. Unlike film camera, which I still use, my DSLR won't be dead as long as I can get the memory cards and batteries. I can stock up the memory cards and it's not too hard to rebuild old battery pack if the replacement battery pack is no longer available. Unlike film which I need a steady supply of film and chemical to process them. I doubt that the rapid dead of DSLR like you said but I sure wish it happens because it would allow me to buy those slightly used top of the line DSLR cheap. Personally, I will probably never go the mirrorless route. My reasons are is that I still like looking through a viewfinder and being able to frame the shot just like I want. I never have liked electronic viewfinders and probably never will. I may be biased there but most pro photographers feel the same way I believe. Not that I am a pro, but I have been a photographic enthusiast for many, many years. I wasn't specifically saying 10-15 years from then. What I meant was for Nikon which is now. But I am NOT shooting down mirrorless. I'm just saying that now isn't the time. Look at the development time it took Nikon to go from the D70 to the D7500 which are (essentially) the same line. Also when the D70/D70s were out, there was NO FX … Dx was your only digital option. And as for the 2010... maybe but that wasn't Nikon.. Digital cameras were around prior to the D70 but they were all point and shoot. Look at the Agfa and other "original" digital cameras. By the way, Epson made the first mirrorless camera in 2004 Epson R-D1, however Panasonic released the first mirrorless 4:3 camera in 2006. My point is that even with prior development by other companies, it takes time to get the interchangeable lens setups created, autofocus and all of the simple things that we've come to demand in our camera gear. Nikon was fortunate in the DSLR work because they kept most of their film lenses compatible. If they wanted to work from scratch they have to create the entire foundation of supporting equipment... auto setting flashes etc. to go with it. It's not a point and shoot with all of the usable accessories built in... its a slr camera with interchangeable lenses and other parts that have to either be kept to certain sizes or made from scratch. We don't know what kind of camera Nikon will introduce for sure but if Nikon hope to get into the market their offering must be at least comparable to those of Sony, Fuji, Olympus and Panasonic and not a camera of 2010. Mirror clatter. And silent shutter comes in handy with wildlife. Nice to see Nikon getting in on mirrorless. I am quite sure they will have IBIS. I have to ask why Nikon and Canon have to change the lens mount in their mirrorless cameras. I suppose one could make a case for adjusting how the current full-frame lenses are inserted into the camera body vs. a preferable design. I know progress requires change and many don't embrace change eagerly. I guess I'm old enough to be one who resists what might be unnecessary change. I wonder, if the anticipated adapter allows current lenses to be used without negative impact, why the change is ultimately so necessary, unless the objective is just to obsolete current lenses and provide a perceived need to spend money to have an excuse to buy new lenses. I suspect there is a profit opportunity involved...call me suspicious. I admit to not being all that concerned since my experience with mirrorless cameras hasn't been very compelling in the first place. My Sony NEX7 seldom, if ever, gets pressed into service these days. I know I'm talking about an early mirrorless model, but my motivation to change is seriously lagging. Instead, I find my Canon 5D Mk IV, 7D Mk II, and 5Ds very satisfying. I don't expect that the promise of new mirrorless models from Canon or Nikon will motivate me to dump a wad of money in the anticipation of greatly improved IQ. There still is a definite difference between need and want and I don't think I'm going to want to pay for marginal change...if that's what we are ultimately offered. Better the devil I know than the devil I don't know...at least for the foreseeable future. A mark of an intelligent company is often its willingness to cannibalize its own products to create something newer and better. Frankly, I thought Nikon should have created a new mount long ago. Like, say, 1987? I'm smilin' at ya' dear chap, 'cos you remind me of the medieval king in the attached photo. So many "long-time" DSLR users letting bias get in the way of learning about mirrorless. No offense ! Why don't you find a Fuji store and take a real close look at the viewfinder of the Fuji X-T2 ....... your bias may be expunged ! Because no mirror box means the body is thinner and the lens is much closer to the sensor, so existing F mount lenses (in Nikon's case) would not focus properly without an adapter to increase the distance the same as in current DSLRs. They could have designed a mirrorless body with an F mount but they would have had to make the body the same thickness (lens mount to sensor distance same) as current DSLR design, except without a mirror assembly, but this would prevent the possibility of new improved lenses to match. They made the mount opening wider to accommodate an adapter for F mount lenses - this prevents vignetting due to the extension tube blocking the light path and also opens new possibilities for better light transmission to the sensor - probably the reason for the current theme on their site. The wider opening might also enable future medium format designs...does anyone think Nikon would venture there? I wonder if the adapter will enable AF in older "D" lenses with the screw drive? Nikon and Canon know that new lenses specifically designed for the reduced flange distance , better autofocus systems and with lighter weight will be HUGE selling points for their fullframe mirrorless to compete against Sony and other top mirrorless systems that offer more modern designed ,lighter weight and/or smaller sized, and quicker focusing wide to telephoto mirrorless lens systems. Especially Nikon needs to update their lens designs to be fully electronic focus and electronic aperture control, which they are all not completely now. You have not owned or shot with the top-quality, top performing fullframe mirrorless cameras from Sony. That would be a revelation. Nikon and Canon know they are losing both amateur and professional customers ,new and old ,whom are choosing or switching to these leading-tech fullframe mirrorless from Sony and even really excellent APS-C mirrorless from Sony and other makers. They have to compete or forever see their market share shrink even further. That is compelling reason alone for their going full bore with cameras and lens designed to take best advantage of their new fullframe mirrorless tech. Both Canon and Nikons older lenses, even with their branded converters ,wont work as well on these new cameras as lenses designed for these systems. 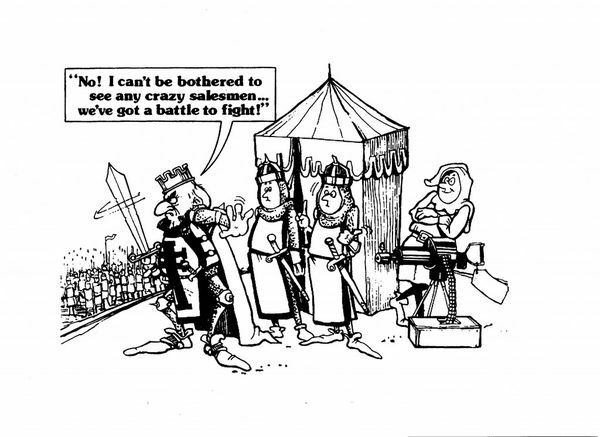 That cartoon brings back memories for me - it was used by a former sales/marketing company I used to work for promoting their services - very funny!